Clarity Clarity refers to the amount of inclusions or impurities existing in the diamond. Inclusions are usually another mineral that has been trapped inside the crystal as it was forming. Clarity is also affected by internal cracks. The GIA (Gemstone Institute of America) has developed a system for grading diamond clarity. The highest grade of clarity (IF) is very rare in jewelry. Stones with this clarity are investment grade. The clarity grading effects the value and price of the diamond, but most people really cannot tell the difference between a VS2 and a VS grade diamond just by looking with the naked eye. 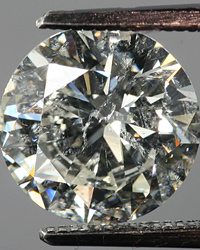 Here is a picture of a diamond with SI inclusions. You can see the white whispy "ghost crystals" inside it. Here is a table with photographs of emerald cut diamonds with different levels of clarity. IF Internally flawless diamonds like this one are very rare. They are used more often as investment stones than in jewelry. VVS We cannot tell the difference without a microscope between a VVS and IF diamond. But the value difference is significant VS Most of the fine diamond jewelry available is of VS clarity. Trained eyes can begin to see a slight difference. SI At this level of clarity, some inclusions are definitely visible.